(Newser) – A burger and fries. Coffee and doughnuts. Milk and ... curry spice? If you haven't tried it yet, you're missing out on what Saba Imtiaz at the Guardian calls "2016's drink of choice." Cafes from San Francisco to Sydney are selling their own version of the traditional drink from the Indian subcontinent, known as haldi doodh: a combination of milk and turmeric. Yes, that turmeric, the yellow Indian spice usually found in curries. Haldi doodh has long been a staple in India for its purported health benefits—proponents say it's good for everything from depression to cancer—but the drink is now taking hold in the West. It's typically made with juiced turmeric root, almond, cashew, or soymilk, and dubbed a turmeric latte or "golden milk." 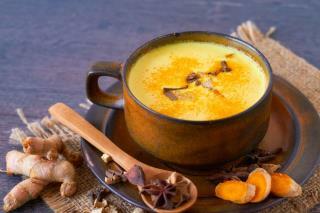 Curcumin is the active ingredient in turmeric that supplies all the great health benefits. The article should have clarified this. The amount of curcumin in these drinks is modest, though if one likes the drink, no reason not to go for it. (It's not my cup of tea, though.) However, taking a reliable and trustworthy curcumin supplement will reap the most benefit. It's true that many of these supplements are way overpriced, and some may not live up the labeling in the amount and type of curcumin in the product, so buyer beware. Someone wrote a great comparison (especially regarding price, value and quality) of most of the brands sold by Amazon on the Amazon curcumin reviews section, which I found quite helpful. This is gross. Turmeric goes well with other spices in Indian food. Just turmeric and milk is yuck. Speaking of Curry, the Warriors played one hell of a game to come back and win game six to tie the series.